The federal government has been airing ads touting its Canada Jobs Grant for training workers, but the Conservative government House leader acknowledges the announced program is merely a "proposal that needs to be fleshed out." The Harper government is spending hundreds of thousands of dollars advertising a program that does not yet exist. Prime-time ads began airing this week during NHL playoff games — currently the priciest advertising real estate on the dial — that tout a new federal Canada Jobs Grant for training workers. The trouble is, the freshly announced program is at present little more than a concept that has yet to be negotiated with provincial governments, and requires buy-in from employers as well. Peter Van Loan, the Conservative government House leader, described the Canada Jobs Grant last week as a "proposal that needs to be fleshed out and developed fully." "What we've announced is a concept of how it could work," Van Loan said in Toronto as the government began what it calls roundtable consultations on the proposal. The concept requires that Ottawa, the province and the employer kick in up to $5,000 each toward the training of a worker. Legislation to create the federal training grant is still months away from even being considered by Parliament — which is why the TV ads note in fine print that the program is "subject to parliamentary approval." But the program will also require provincial agreement, and that of business. "The Canada Job Grant will be introduced as part of the renewal of the labour market agreements with the provinces and territories in 2014-15," Human Resources and Skills Development said in an emailed response. "Its final design will be negotiated with provinces and territories over the next year, in consultation with stakeholder groups." The department did not respond directly to questions about the ethics of spending public funds to advertise programs and services that do not exist. "It is important the government communicates about programs that benefit Canadians and their families," said the email. The Conservative government has come under increasing scrutiny for its lavish spending on feel-good "economic action plan" ads that deliver little useable information but tell viewers that Canada's economy is flourishing. Ottawa has spent at least $113 million on the ads since 2009. No budget was provided for the latest media blitz, but with ads on Hockey Night in Canada costing up to $95,000 per 30-second spot, the ad buy could easily be in the millions of dollars. An anti-Harper protest group with a naughty name, found at www.shd.ca, has been soliciting money to air its own TV ad mocking the government's "economic action plan" blitz. The group said Friday that it had raised $66,000, two-thirds of the cost of a single airing during Hockey Night in Canada. 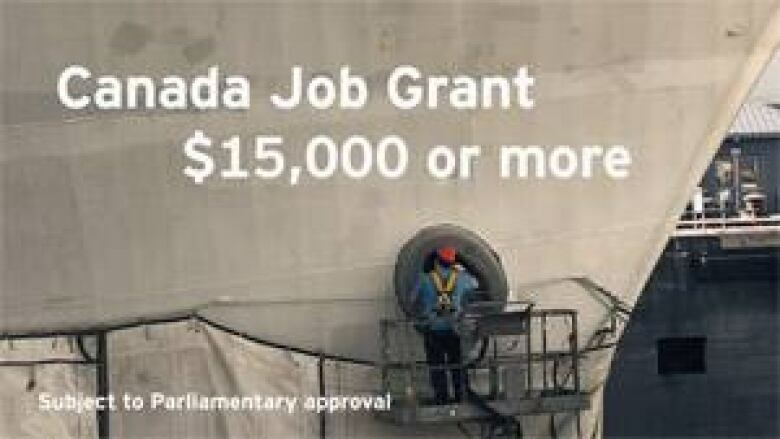 Jonathon Rose, an expert in political advertising, called the Canada Jobs Grant advertisement "misleading." Rose, a political science professor at Queen's University in Kingston, Ont., sits on Ontario's independent government advertising advisory board, which is legislated to ensure government ads are non-partisan, informative and fact-based. He said the currents ad's "proviso — 'subject to parliamentary approval' — does not offset the verb 'will partner' or 'will result,' which makes it seem like a foregone conclusion." "Government ads are not excluded from the Canadian Code of Advertising Standards and I think this would fail tests of accuracy and clarity on a number of levels," said Rose. Agnes Maltais, Quebec's minister for employment and social solidarity, was equally blunt. French-language versions of the ad are running in Quebec, where the provincial government has already stated it is not interested in taking part. "The ads on the Canadian job grant are the blatant proof of the bad faith of the federal government," Maltais said in an email. "On one side, the federal government says it wants to 'negotiate' with the provinces the reform of the job market deals, and on the other side it launches ads selling the Canadian job grant." Liberal MP John McCallum, the party's Treasury Board critic, called the current ads "totally offside." Imagine Stephen Harper's reaction if past Liberal governments had spent millions of dollars advertising universal daycare or the Kelowna Accord while the measures were still being hashed out, McCallum said. "I think he would have gone apoplectic, and rightly so." Mathieu Ravignat, the NDP Treasury Board critic, said the whole idea of parliamentary approval appears to have "become a farce" for the majority Conservatives. No Canadian can access the program being advertised, he noted. "It's about selling the Conservative brand to Canadians," said Ravignat. "They know things are not as rosy as they would like to paint them with regards to the economy. It's about appearing like good financial managers, good job creators, and it's about damage control." "This is all sorts of wrong."